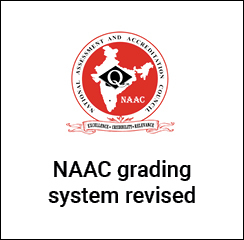 In what could lead to a better quality differentiation of educational institutions, the National Assessment and Accreditation Council (NAAC) has revised its grading system to a seven grade scale from erstwhile four grades. The new grading system of Cumulative Grade Point Average (CGPA) range has been implemented by the council from July 1, 2016. The HRD minister also informed that the former system of descriptors for letter grades, i.e., Very Good, Good, Satisfactory and Unsatisfactory has been discontinued in the revised NAAC grading system. The National Assessment and Accreditation Council (NAAC) grades institutions based on their performance vis-Ã -vis set parameters through introspection.